The 2017 Volkswagen Amarok is now available in the market, the new medium-size pickup with a new look and interior with a new finish; as well as a list of more stuffed serial items, especially safety equipment. According to the manufacturer, the utility brings innovative technologies in the category. Among the highlights are the Post-Collision Braking system. Exclusive in the category, it can be automatically trigger the vehicle’s brakes when it engages in a collision; aiming to reduce residual kinetic energy. The brake activation of the post-collision braking is carried out with the detection of the initial collision by the sensors of the airbags. Other equipment is the “off-road” ABS brake system, which is able to optimize the action of the antilock brake system on lose ground; like pebbles and sand. The list also includes Isofix system for securing child seats in the rear seat and driver assistance items such as the BAS (brake assist system), ASR (traction control) and EDL (electronic differential lock). In other items, the 2017 Volkswagen Amarok offers electronic stability control (ESC); Hill Descent Control (HDC) and Hill Start Assist (HSA). All versions of the Volkswagen pickup are equipped with acoustic and visual alarm system for non-buckled seat belts on the front seats. In the Highline model, of serial, there is a standard tire pressure loss indicator; which with the use of four sensors installed in the tire inflation valves, directly measures the pressure of each tire and alerts the instrument panel if one of them has the pressure below of the recommended value. Amarok Highline also offers side thorax and head airbags for driver and passenger and bi-xenon headlamps with LED daytime driving lights. 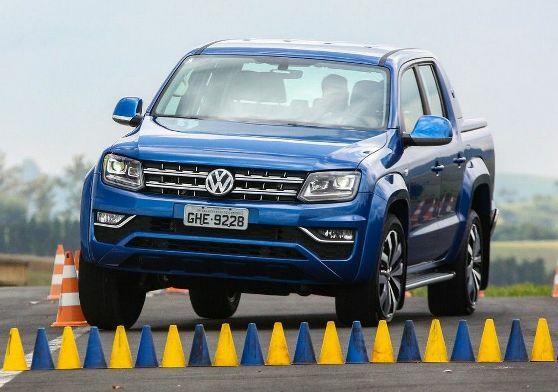 The Volkswagen Amarok offers the S variants (single cab and double cab); SE; Trendline; Highline and Highline Extreme Series (always with double cab body). The S version uses a 2.0 turbodiesel engine with 140 hp of power and 34.7 kgfm of torque, always with a six-speed manual transmission. The other variants offer a 2.0 turbodiesel of 180 hp and 40.8 kgfm with manual transmission (in the SE version) or 42.8 kgfm with an automatic eight-speed gearbox (in other configurations).